A powerful magnitude-8.2 earthquake struck off northern Chile on Tuesday night, setting off a small tsunami that forced evacuations along the country's entire Pacific coast. Five people were crushed to death or suffered fatal heart attacks, the interior minister said, but Chile apparently escaped major damage or serious casualties. 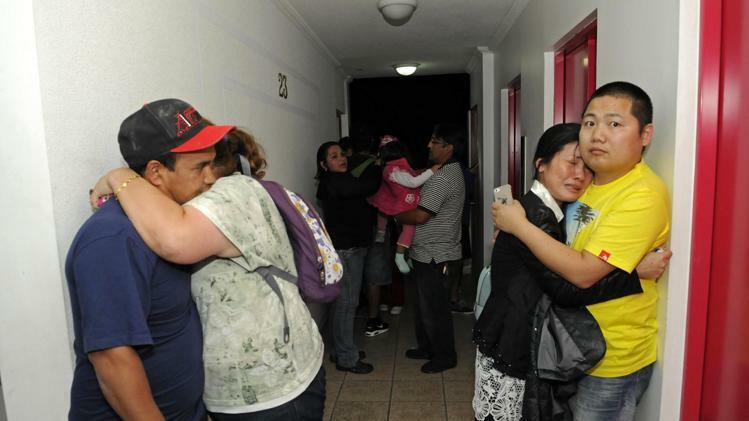 People embrace on the upper floor of an apartment building located a few blocks from the coast where they gathered to avoid a possible tsunami after an earthquake in Iquique, Chile, Tuesday, April 1, 2014. The shaking loosed landslides that blocked roads, power failed for thousands, an airport was damaged and several businesses caught fire. About 300 inmates escaped from a women's prison in the city of Iquique, and Chile's military was sending a planeload of special forces to help police guard against looting. In the city of Arica, 86 miles (139 kilometers) from the quake's epicenter, hospitals were treating minor injuries, and some homes made of adobe were destroyed and 90 percent of customers were without power, authorities said. The quake also shook modern buildings in nearby Peru and in Bolivia's high altitude capital of La Paz. "We regard the coast line of Chile as still dangerous, so we're maintaining the warning," geophysicist Gerard Fryer at the Pacific Tsunami Warning Center told The Associated Press. Chile's Emergency Office said its tsunami watch would remain in effect for six more hours, meaning hundreds of thousands of people along the coast would not sleep in their beds. Swimmers and surfers in the U.S. state of Hawaii, thousands of miles away in the Pacific, might see higher waves Wednesday, the warning center said. The quake was so strong that the shaking experienced in Bolivia's capital about 290 miles (470 kilometers) away was the equivalent of a 4.5-magnitude tremor, authorities there said. More than 10 strong aftershocks followed in the first few hours, including a 6.2 tremor. More aftershocks and even a larger quake could not be ruled out, said seismologist Mario Pardo at the University of Chile. Interior Minister Rodrigo Penailillo said President Michelle Bachelet was closely watching the situation and was ready to take "any measures" to ensure people's safety. Hundreds of soldiers were being deployed in the quake zone, and a flight would be leaving soon with 100 special forces on board, he added. Chile is the world's leading copper producing nation, and most of its mining industry is in the northern regions. Top mining companies said there was no serious damage to their operations so far.